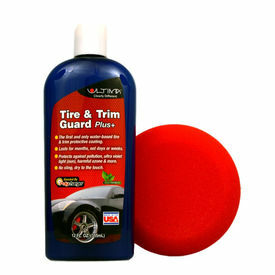 Ultima Tire & Trim Guard Plus - 12 oz. Ultima products are not watered down. An application of Ultima Tire & Trim Guard Plus for instance leaves nearly all of the Polycharger® polymer on the tires & trim for the entire season, leaving them protected. Ultima sealants are all clear and have no color. Ultima doesn't waste any room in the bottle with die, water, emulsifiers, powders, or silicone. They are indeed "Clearly Different". Some of the Ultima products appear expensive. But take a closer look, you'll find that they are actually less expensive than most traditional products per application. It takes less than a 1/4 oz of Ultima and an ounce of a competing product for certain jobs. The competing product would have to be 4x cheaper per ounce in order to compete with the cost. This is before you even factor in the durability of Ultima products which last much longer. Ultima products certainly last much longer than any product that is less expensive per oz. Ultima Tire & Trim Guard Plus is a new polymer coating technology that can be applied to most flexible automotive surfaces such as vinyl, rubber and plastic. It coats, seals, and protects while adding a beautiful glossy finish. Bundle comes with Ultima Autospa Tire and Trim Dressing Applicator for ease of use. Ultima Tire & Trim Guard Plus, 12 oz. On large areas, spray directly on the finish and rub in with a foam applicator. On smaller surfaces, spray on applicator and apply to the desired finish. On porous surfaces, such as tires and rubber trim, allow Tire & Trim Guard Plus to dry without buffing. On hard, glossy surfaces, such as your wheels and chrome trim, buff dry to a high gloss shine. For additional gloss on tires, a second coat may be applied after 20 minutes. Note: For exterior use only. When washing tires and wheels treated with Tire & Trim Guard Plus, it is not necessary to use harsh cleansers and detergents.